One of my goals for 2010 is to become a Marathon Maniac. In a previous post, I detailed how my attempt at accomplishing this task by running the Goofy Challenge was thwarted because I failed to read the fine print of the Marathon Maniac requirements. 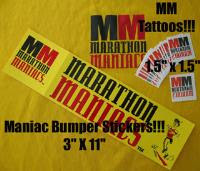 To become a member of the Marathon Maniacs you need to complete one of the following Criteria within the LEVEL. Depending upon which streak you have completed will determine your placement LEVEL. 1. 3 Marathons within a 16 day time frame. 2. 6 Marathons in 6 consecutive calendar months. 3. 8 - 11 Marathons within 365 days. 1. 4 Marathons within 37 days. 2. 12 - 18 Marathons within 365 days. 3. 4 Marathons in 4 different US states, Countries or Canadian Provinces (any combination) 51 days. 1. 4 Marathons in 23 days. 2. 19 - 25 Marathons within 365 days. 3. 2 Marathons in 2 days (or 48 hours) must finish both races! 4. 9 Marathons in 9 different US states, Countries, or Canadian Provinces (any combination) within 365 days. 1. 3 Marathons within 3 days. 2. 26 - 30 Marathons within 365 days. 3. 4 Marathons within a 9 day window. 4. 3 Marathons in 3 separate US states, Countries, or Canadian Provinces (any combination) within a 10-day time span. 5. 13 Marathons in 13 different US states, Countries, or Canadian Provinces (any combination) within 365 days. 1. 31 - 37 Marathons within 365 days. 2. 16 Marathon in 16 different US states, Countries, or Canadian Provinces (any combination) within 365 days. 3. 6 Marathons within 16 days. With proper planning and rest this can be done! 1. 38 - 44 Marathons within 365 days. 3. 13 Marathons within 79 days. 1. 45 - 51 Marathons within 365 days. 2. 23 Marathons in 23 US states, Countries, or Canadian Provinces (any combination) within 365 days. 3. 28 Marathons within 183 days. 1. 52 Marathons or more within 365 days. 2. 30 Marathons in 30 US states, Countries, or Canadian Provinces (any combination) within 365 days. 3. 20 Countries within 365 days. Races can be run on either Saturday or Sunday. We will take into consideration that Boston is on a Monday and lake Tahoe is a three day event that starts on a Thursday. All races need to be official events, no training runs will count! To be a Marathon Maniac times are not an issue, just that you finish your races. Also that you are having fun! After all, isn't that why we do this? The bare bones requirement for the BRONZE LEVEL is to run 2 marathons in a 16 day time frame. I only ran a half marathon and a full marathon in a 2 day period, which apparently isn't good enough. To meet their demands, I'm going to run back-to-back marathons on April 10th and April 11th. The realization that it is March already means I only have a few more weeks to prepare myself for 52.4 miles of running in a 48 hour period. On Saturday, April 10th, I will be running the Martian Marathon in Deerborn Heights, Michigan. We will head up on Friday night, run the race Saturday morning, and head back to Dayton after the race. I'll lay in a tub of ice for the rest of the day, and then prepare for impending doom for the next race. On Sunday, April 11th, I will do the Xenia Marathon in Xenia, Ohio. This should be a flat course and is considered to be one of the more "easier" marathons to run, if easy is the right word to describe it. Once that race is over, I will get care flighted home and sign up to join the Marathon Maniac club. A few weeks later, I will get a nice Marathon Maniac pen and bumper sticker for my efforts, and all will be right in the world.